Cold Laser / LLLT / Photobiomodutation nomenclature is often debated at conferences. “Cold Laser Therapy” seems to be the most common search term (according to Google). In the UK the most common phrase amongst physiotherapists is Laser Therapy though in the 1980’s and 90’s it was Laser Biostimulation. 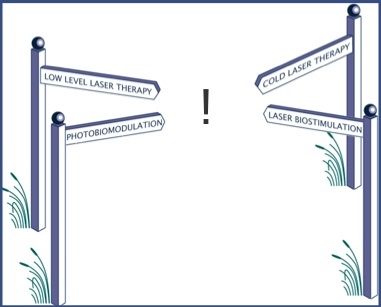 Many US scientists call it Photobiomodulation, it used to be called Laser Biostimulation by the American Society for Lasers in Surgery and Medicine, who last year adopted Photobiomodulation instead. Pubmed have chosen LLLT (stands for Low Level Laser Therapy) as the MeSH term (MeSH stands for Medical Subject Heading), however they lave used that label for almost every form of medical laser treatment (low level or otherwise). The term was coined by Oshiro and Calderhead back on the 1980’s. For the record I am fan of calling it Photobiomodulation and I have managed to get that as the term adopted on Wikipedia a couple of years back (hooray for me). This exercise was triggered by an article in the Independant newspaper today “Doctors warn of ‘cowboy clinics’ if laser therapy is deregulated“. It is an article about UK government deregulation of IPL for hair removal and is just one tiny example of how the distinctions around medical laser devices are not being made. I wonder if the journalist has any idea that at another end of the scale lasers improve tissue repair, reduce inflammation, reduce pain and some would argue even stimulate hair growth (Mester to name but one example). Materials: GaAlAs, Gallium Aluminium Arsenide, GaAs, Gallium Arsenide, HeNe, Helium Neon, AlGaInP, Aluminium Gallium Indium Phosphide, CO2, Nd Yag.